Mo Better Jaguars' coaches and players huddle at the end of practice at Betsy Head Park in Brownsville, Brooklyn in September 2014. Fears of brain injuries has deterred many parents and their children from choosing to play football. After years of publicity about how dangerous football can be, football enrollment has declined 6.6 percent in the past decade, according to data from the National Federation of State High School Associations. Those who still play the sport are increasingly low-income students. Over the past five years in Illinois, the proportion of high school football rosters filled by low-income boys rose nearly 25 percent – even as the number of players in the state has fallen by 14.8 percent over the same period, according to a story out this week from HBO's Real Sports. This doesn't surprise Albert Samaha, a BuzzFeed News investigative reporter and author of "Never Ran, Never Will: Boyhood and Football in a Changing American Inner City." 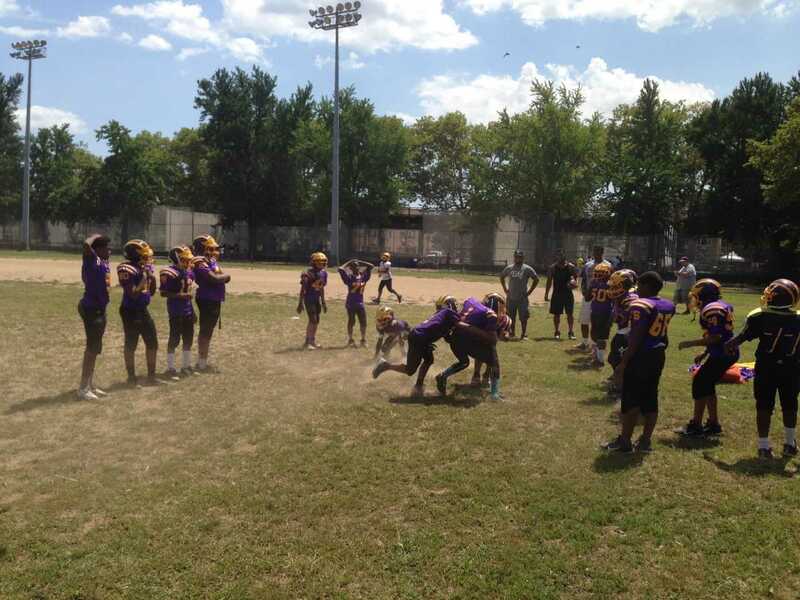 Samaha spent two seasons embedded with the Mo Better Jaguar football program in Brownsville, a small Brooklyn neighborhood overburdened with poverty and crime. The program is for children ages 7-13, who are all aware of the risks of playing football, but play anyway. 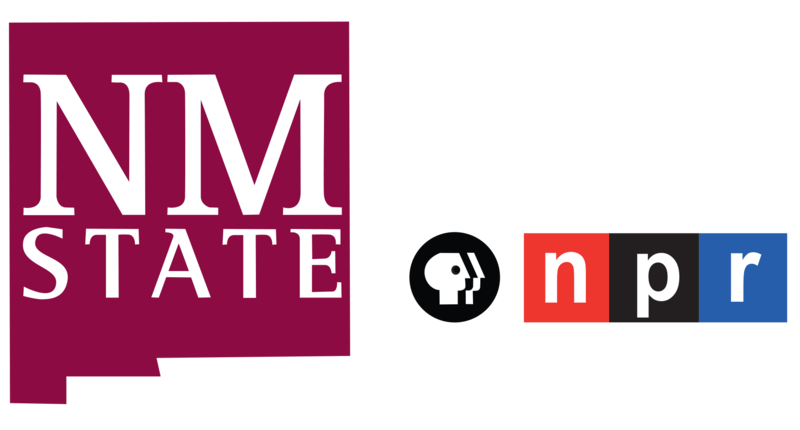 "The reason that football is so valuable to them is the fact that it's still the sport that that's the most popular in America, that is getting the most money from high schools and colleges in America," Samaha said in an interview with NPR's Michel Martin on All Things Considered. "At a time when the educational gap continues to widen between low income, particularly black and brown kids, and higher income white kids, football offers a path to upward mobility that is not really available through any other extracurricular activity." 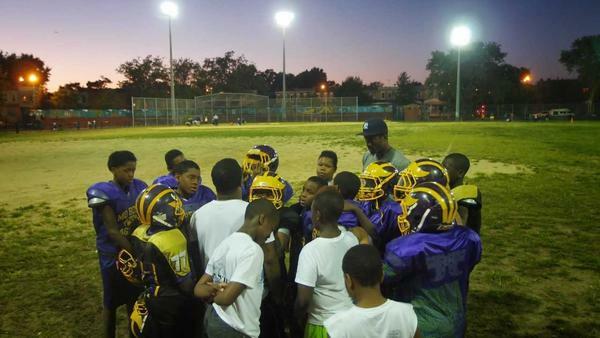 Many of the 10, 11, and 12-year olds who Samaha reported on told him that they were playing football not just for the chance of getting a college scholarship, but also for the chance to get financial aid for top private high schools in New York City. Their hopes were reinforced by private high school coaches who attended Mo Better Jaguar football games and told the boys that if they played well enough, they could get a scholarship, and with that scholarship, avoid the student debt and poverty that so many in generations before them faced. "Kids feel pressured to play football, it's rooted in the problem of education," Samaha said. 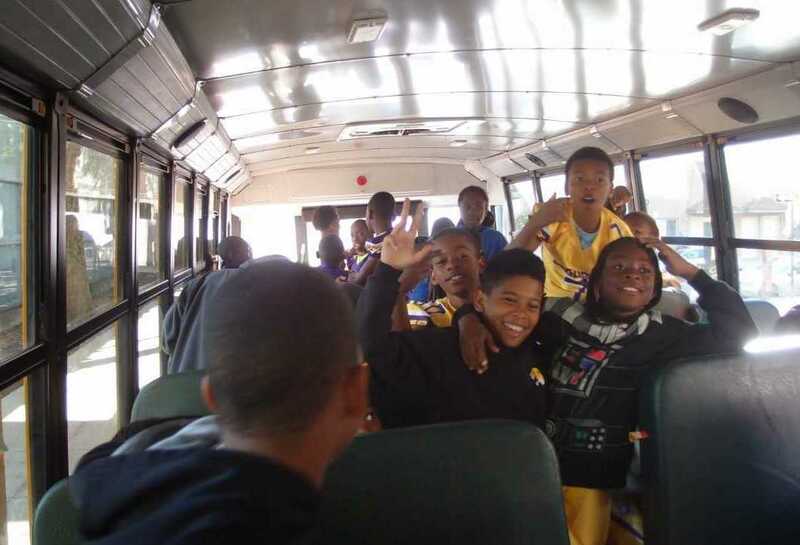 Kids on the Mo Better Jaguars football team board a bus in Brownsville, Brooklyn to go to a game in September 2014. So why do so many low-income students choose football, and not a different, less dangerous, sport? Why not try for a baseball scholarship? Or soccer? The odds of getting a college scholarship for a man playing football at a NCAA or NAIA school is 43:1, according to MarketWatch, and football offers far more athletic scholarships at NCAA and NAIA schools than any other sport, numbering close to 26,000 per year. At the high school level, schools are investing big money into football as well. One high school in Katy, Texas, just outside of Houston, recently spent over 70 million dollars on a new state-of-the-art football stadium. "As long as the money is going into this activity this is where the opportunities are going to be," Samaha said. Additionally, unlike some sports, football has a relatively low barrier of entry of participation, because there are so many positions that rely on differing capabilities. "Football unlike other sports doesn't require you to be a certain size or certain height," Samaha said. "You can sort of play it whether you're overweight whether you're underweight. It's sort of the most in some ways meritocratic of all the sports available for these opportunities." But with the opportunity to achieve affordable higher education, playing football also brings the risk of long-term brain damage. Boys on the Mo Better Jaguars Pee Wee football team collide during tackling drills on the first full-contact practice of the season in August 2014. A report by the Journal of the American Medical Association, published in 2017, showed that in a study of 111 brains of deceased former National Football League players, 110 had evidence of chronic traumatic encephalopathy (CTE). CTE has been linked with repeated blows to the head, and can result in behavioral changes and cognitive decline. Some of the behavioral side effects include difficulty with impulse control, aggression, emotional volatility and rage behavior. Extensive signs of CTE has been found in the brains of former NFL stars such as former New England Patriots tight end Aaron Hernandez, who hung himself in a prison cell while serving a life sentence for murder. It's not just NFL players though. The same study showed that in the 202 brains examined across all levels of play, nearly 88 percent of all the brains, 177, had CTE. Low-income students who choose to play football know about these risks, Samaha said, but have factored it into a bigger risk assessment calculation. For them, playing football is still worth the risk, because they're trying to avoid other dangers. Boys on the Mo Better Jaguars youth football team line up for warm ups during practice in September 2014. "It's a luxury to worry about these long-term, sort of abstract damages to these kids and their parents," Samaha said. "The risks are all around them — the risks of not going to high school, the risks of not making it into college, or the risks of of falling into kind of the street path that they'd seen other people around them fall into." Football is their ticket out. But Samaha argues that America needs to reckon with the broader ethical implications of the sport. "America's dual commitments to football and racial oppression have meant that the danger of the sport will increasingly fall on the shoulders of low income black and brown kids," Samaha said. Meanwhile, he says, the money from the sport is mainly going to white coaches and white owners. Samaha likened the disparity between the people who participate in football and the people who benefit to a "gladiatorial dichotomy." Meanwhile, there has been no real decline in viewership for the sport. A 2017 Gallup poll showed that football still leads as America's favorite sport, with 37 percent of U.S. adults choosing it as their favorite sport to watch. Millions are expected to watch the Super Bowl on Sunday, including Samaha. "I feel guilty about it but I watch every Sunday," he said. "I don't know how to reckon with that." Sunday night, as millions look on, the players will inevitably clash in tangled lines of bodies on the field, perhaps risking a lot for a few yards — risking more to win. On this Super Bowl weekend with all the hype and hoopla, it can be hard to imagine that football is actually losing popularity. But after a decade of publicity about brain injuries, many boys and their parents are choosing less risky sports like soccer or basketball. A national association that tracks high school sports - how the participation in football programs has dropped by 6 percent over the last decade. There is an exception to this trend - low-income students. HBO reported this week that in one state, Illinois, participation in football by low-income high school students has actually risen 25 percent over the last five years. Albert Samaha has given a lot of thought to the reasons behind this. He's the author of the book "Never Ran, Never Will: Boyhood And Football In A Changing American Inner City." And he's with us now. Albert Samaha, thanks so much for talking to us. ALBERT SAMAHA: Thank you for having me. MARTIN: Now, I understand that you played football yourself in college. How did you get started in the sport? And did you think about the risks when you were playing? SAMAHA: I did not think about the risks. You know, I got started in sport, I think, in the most traditional possible way, which is that a lot of my older relatives, my cousins, my uncles watched the sport, played the sport. And, you know, I played football, basketball, baseball, like a lot of other kids, and I just happened to be best at football. And it really wasn't until lately that I've even thought about the long-term damage that could happen to me and whether I would ever want if I had, you know, a son to let that kid play football. I hadn't really thought of that before. MARTIN: So you spent two seasons reporting on the Mo Better Jaguars, which is a Pop Warner team in Brownsville, Brooklyn. And I will confess that I'm familiar with this community because I grew up there. But tell me about the kids who were playing with this team and why. And one of the things that really intrigued me about your reporting is that you said that this is the first generation of players to really know the risks or to think about the risks. So just talk a little bit about the community and why kids play there. SAMAHA: Yeah. So, you know, Brownsville is kind of notorious for having the highest concentration of housing projects of any zip code in America. It's one of the, you know, more low-income communities in New York City and across America. And, as you mentioned, for two, three years, I kind of embedded with these 10-, 11-, 12-year-old kids. And I think one of the things I found most interesting is that when I think a lot of people on the outside think about why kids play football, their assumption is, oh, well, you know, they're just putting all their hopes and dreams into these NFL aspirations. But I found that wasn't the case at all - that, in fact, you know, these kids were playing not just because they wanted college scholarships but because they wanted financial aid to some of the top private high schools in the city. And I think, you know, the reasons that football is so valuable to them is the fact that it's still the sport that's the most popular in America, that is getting the most money from high schools and colleges in America. And at a time when, you know, the educational gap continues to widen between, you know, low-income, particularly black and brown kids and higher-income white kids, football offers a path to upward mobility that is not really available through any other extracurricular activities. MARTIN: Why football? Why not other sports? SAMAHA: It's a numbers game. Football offers far more college scholarships than any sport even though football only covers boys and not girls. You know, there's more football scholarships available for boys than there are basketball and soccer and baseball scholarships available for boys and girls. Not to mention the fact that, obviously, basketball requires certain physical attributes - you know, a certain amount of height. Football, unlike other sports, doesn't require you to be a certain size or certain height. You can sort of play it whether you're, you know, overweight, whether you're underweight. There are different positions you can play. It's sort of the most in some ways meritocratic of all the sports available for these opportunities. You know, kids aren't going to get the same opportunities if they're really, really good at playing the trumpet or really, really good at chess because this is where our society has decided to put its priorities. MARTIN: So you talked about how the kids are very savvy. What about the parents? I mean, well, we'll talk about the kids and the parents. I mean, they've presumably heard about the risks of brain trauma that has been part of the conversation for the last, you know, decade. Are they aware of this? SAMAHA: They are aware of it. And I think to a lot of these kids and their parents, it's the luxury to worry about these long-term sort of abstract damages, right? Like, to these kids and their parents, the dangers are all around them, the risks are all around them - the risks of not going to a good high school, the risks of not making it into college - so they have to kind of prioritize their needs. And they have these immediate needs to get into good schools and to have opportunities to reach upward mobility that kind of those distant concerns of what may happen to their brain 20, 30 years down the line. It's a calculus that both the kids and parents have weighed and have decided that these long-term risks are worth putting up with these short-term advancements. MARTIN: There was an article drawn from your book that you wrote for The New York Times back in September, and you talked about the ethical reckoning that this country has to face around football. What is that ethical reckoning, in your view? SAMAHA: I think at the core of this is that the dangers of the sport will increasingly fall on the shoulders of low-income black and brown kids. The money from this sport is going to white coaches and white owners, white university presidents, and the dangers are falling on kind of the least privileged among us. So it's increasingly becoming this kind of gladiatorial dichotomy that we're seeing. And, you know, one question I think a lot of people or at least I wonder a lot is whether the future of football - I think there's kind of three paths. Either it goes in this continuous path that it continues to be the most popular sport in America. It'll just be a higher proportion of poor kids and black and brown kids that are taking the burden of those risks. Or it'll become like baseball, where it'll just kind of slowly decline in popularity, maybe behind soccer and basketball. Or it'll become like boxing, where it loses both popularity and participation rates, and it's increasingly just kind of becoming a sport for the desperate. MARTIN: That was Albert Samaha. He's the author of "Never Ran, Never Will: Boyhood And Football In A Changing American Inner City." He was with us from the NPR bureau in New York. Albert Samaha, thanks so much for joining us. SAMAHA: Thank you for having me. (SOUNDBITE OF HYPNOTIC BRASS ENSEMBLE'S "OYIBO") Transcript provided by NPR, Copyright NPR.